Home » Dips/Sauces » Ron’s Afterburner Mexican Hot Sauce – light your taste buds on fire. Ron’s Afterburner Mexican Hot Sauce – light your taste buds on fire. Light up your life with this fantastic Mexican hot sauce. This sauce is similar to Pico Pica found on the west coast. I like it because it can be used on any food requiring a little nip to the tongue. I love Pico Pica but it’s hard to find here in the Midwest. Soooooo, after a lot of research, I decided to make my own tasty version. Try it. If you like hot sauce, you’ll love this one. A little goes a long way. Thanks to Columbamio for sharing this hot sauce recipe. Light your taste buds on fire with this hot sauce. 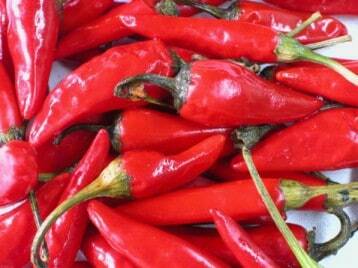 Make sure the red chili peppers are the hot dried type with stems removed. Bring all ingredients, except tomato sauce, to a boil, turn down heat and simmer about ten minutes. Remove from heat and let cool. Place in blender and add tomato sauce. Blend until smooth. I made this for company and they loved it.